Purim is Sunday! My kids love to wear costumes and bake hamentaschen, triangular cookies with filling. Now for my secret hamantaschen recipe: gingerbread with nutella filling! We make both these and the traditional ones and give away boxes to our friends and family. Here are my favorite Purim family fun activities and recipes. Instead of men cookie cutters, use circles. If you don’t have a cookie cutter, you can use a glass. Put the leftover dough (in between circles) into a ball and roll out again. Imagine an equilateral triangle inside your circle, with the three corners touching the outside. Put a spoonful of Nutella in the center. Pull up the three edges so that it’s shaped like a triangle. 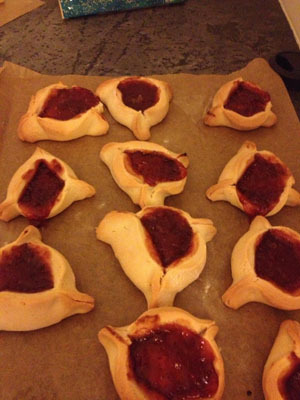 Traditional Hamentaschen: Leeba Aminoff’s family recipe is fantastic! Mix eggs and sugar together on medium with a blade mixer. Add oil, vanilla, baking powder and salt. Gradually add flour. Refrigerate in a bowl for 30 minutes. Roll out on a surface, using plenty of flour to prevent sticking, to 0.25” thickness. Cut rounds with a cookie cutter. Fill with jam or nutella and fold the sides into triangles, per the above recipe. Bake at 365F for 7 minutes. One hamentaschen per person (note that Nutella has hazelnuts, in case of allergies). At least one additional food item ready to eat, such as raisins, oranges or crackers. Stickers, tattoos and other fun items around the house. Deliver in person on Purim (March 15-16). Rules suggest a go-between; my children always like to deliver in person. While it’s traditional to deliver to other Jewish families, I love to include some of our non-Jewish friends to spread the love and share our customs. Costumes! 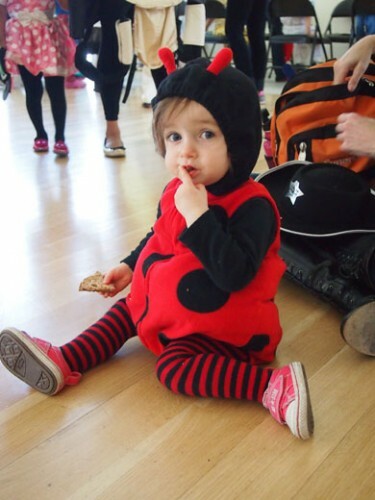 Traditionally, children dress up as characters from the story of Purim, but in our preschool, children use their Halloween costumes. My children love an extra opportunity to use their costumes. Carnival. Many synagogues have Purim carnivals that are open to the public. Ours has a magician show, fun activities, snacks and more. 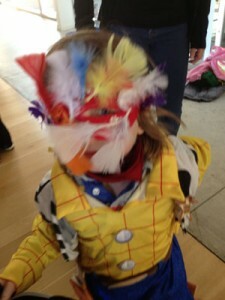 The preschool director tells the story of purim with a puppet show, and the children wear their costumes. You might enjoy this event whether or not you are Jewish. Giving charity to the poor and tzedakah is also a tradition for Purim. This Purim Social Justice Guide from ReformJudaism.org is a great resource.